As 2013 comes to a close, it’s time to take a look at what came to pass this year for education in North Carolina. 1. Tax dollars now can be funneled to unaccountable private (and home) schools. Lawmakers passed a budget last July that allows parents to send their kids to private schools with annual taxpayer-funded $4,200 vouchers. Dubbed “Opportunity Scholarships,” the program was championed by Rep. Skip Stam, who believes that all parents should be able to send their kids to any school on the taxpayer’s dime—even if that school teaches kids that dinosaurs walked the earth with man or the KKK was just a band of moral-minded folks. On tap for 2014: We’ll keep you posted on the roll out of the school voucher program, which will begin accepting applications in February in anticipation of its Fall 2014 start date. Stay tuned for developments in the school voucher lawsuit that was just filed by 25 teachers who oppose using taxpayer dollars to fund private education. And read my most recent story about one home school that’s classified as a private school by the state, allowing it to receive vouchers too. 2. Teachers are now just temp workers. Teacher tenure, formally known as “career status,” was eliminated by lawmakers who were interested in introducing free-market principles to the teaching profession by way of short-term contracts and small pay increases for the top 25 percent. Tenure, which isn’t a guarantee of a job but rather a guarantee of due process in the event a teacher is fired or demoted, was an important benefit to teachers who often found themselves at the mercy of politicized school boards. But Sen. Phil Berger, a key proponent of the new contract system, said tenure made it too difficult to get rid of bad teachers. On tap for 2014: We’ll look at how many of the top 25 percent of teachers who are currently tenured will give up their job security for the meager pay increases that come with 4-year contracts. Teachers who have talked with NC Policy Watch have said they will reject the contracts if they are offered them. And we’ll also keep you posted on the lawsuit filed by public school teachers who allege that the repeal of career status violates state and federal constitutions by denying teachers due process rights. 3. Goodbye North Carolina, hello anywhere else that pays a living wage. Once again, lawmakers decided that paying teachers a living wage was not a priority, prompting buzz about the state being on track to become a net exporter of teachers. Not only were wages frozen, but the salary supplement for teachers who get their master’s degrees was also eliminated. Teachers have only seen one small raise (1.2%) during the past seven years or so, and even that pay increase has been offset by increases in health insurance premiums. The state has slipped to 46th in teacher pay in the nation—no big surprise considering it takes somewhere in the neighborhood of 15 years to break $40,000 per year for teachers with bachelor’s degrees. And that only happens when teachers are actually getting their step increases each year. On tap for 2014: We’ll continue to listen to teachers tell their stories about whether or not they’ll be leaving the state for greener pastures, like this teacher who’s reluctantly leaving the state in order to feed his family with Ohio’s much higher teacher salary. We’ll see if lawmakers decide to institute a pay increase for teachers during the short legislative session next spring (which, incidentally, coincides with an election year.) And stay tuned for the teacher turnover report that will be released next November, which should be an indicator of how many teachers left the state and/or the profession as a result of the actions of this year’s General Assembly. 4. Who needs teacher training? Lawmakers sent a pretty clear signal about what they think about teacher training when they decided to defund the NC Teaching Fellows program, which provides scholarships to undergrads seeking degrees in education and requires that they teach in the state for four years after graduation. More than 75 percent of Teaching Fellows stay on beyond their four-year commitments. Instead, the General Assembly decided to put money toward Teach For America, which offers to college grads who don’t hold degrees in education six-week seminars as preparation for teaching jobs in low-income districts. Only a two-year commitment is required, and retention rates for TFA teachers beyond five years is less than 10 percent. On tap for 2014: Will lawmakers reinstate funding for the Teaching Fellows program after so much public outcry over their move to end it. When North Carolina implemented new curricular standards back in 2010 (which included the Common Core), educators anticipated that test scores would drop when students were examined for the first time based on these new benchmarks. And drop they did—students’ test scores plummeted nearly 30 percent, consistent with what has happened in other states that have also implemented the Common Core standards. There’s a national debate happening now over Common Core, and North Carolina is in the thick of it. Tea party activists (including Dan Forest) have attacked the standards for being not much more than a government take-over of education. Many others, led by education activist Diane Ravitch, are dismayed by Common Core’s corporate backers. Still others, many of them teachers, are simply frustrated by the increased number of tests that students have to take, leaving little time for actual teaching and learning. On tap for 2014: lawmakers are currently studying the Common Core—and some are interested in getting rid of it. Stay tuned for developments. Another legislative decision made last summer? Underfund public education to the tune of $500 million, compared with funding levels back in 2008. Some lawmakers continue to say that last year’s General Assembly funded public education at higher levels than ever before, but if you take into account inflation and increased enrollment, per pupil funding actually dropped. The result? Textbooks are now relics, teacher assistants are a rarity, supplies are donated or bought by low-paid teachers, and few opportunities for professional development exist. On tap for 2014: As public schools cope with fewer resources and fewer talented and well-trained teachers, will parents elect to grab school vouchers and run for private schools? It’s a question that will likely linger beyond 2014, and we’ll keep an eye on the numbers. Two bills helped the charter school movement’s cause in North Carolina last year. SB 337 nixed the old charter school advisory board, which was tasked with holding charter schools accountable, and put in place a new advisory council that mostly comprises pro-charter individuals. The bill also weakened requirements for charter schools to hire licensed teachers and have a racially diverse student body. HB 250 opened up the door for unchecked charter school expansion by allowing schools to add a grade level each year without the State Board of Education’s approval. NC Policy Watch discovered that bill was kickstarted by the CEO of a charter school in Pamlico County who wished to go around the SBE’s denial to allow his school to expand on account of the fact that it would be detrimental to the survival of the local public school. On tap for 2014: With the cap gone on the number of charter schools that can exist in the state, expect more charter operators to look toward North Carolina as fertile ground for expansion efforts. Lawmakers have created a study committee to look into virtual charter schools, even though one for-profit corporation’s attempt to open a virtual charter in the state was most recently blocked by a state appeals court. Stay tuned to see if virtual charters come to North Carolina. The NC Supreme Court sidestepped an opportunity to hold the state accountable in providing a sound and basic education to all its children when it determined that the state was sufficiently fulfilling its responsibility in another Leandro ruling last month. The reality is that while lawmakers may have removed their 2011-imposed cap on the number of pre-K slots available (as well as the “co-pay” families had to contribute), not all of the 35,000+ pre-K eligible students in the state will be able to access pre-kindergarten thanks to—you guessed it—a shortage of funds. On tap for 2014: fewer kids prepared for rigorous study, which will have long-term effects on North Carolina’s economy. 9. Did you forget about higher education? Admittedly, it’s easy to do when the hubbub around changes to Pre-K-12 was nearly deafening. Tuition at community colleges has gone up by 56 percent since 2008. By 2020, more than 60 percent of jobs will require some form of postsecondary education. Who will be able to afford it? 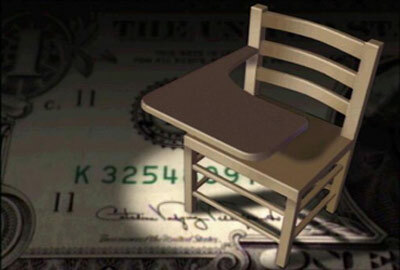 On tap for 2014: There is a rumor circulating that lawmakers will pay for a teacher pay increase by cutting into the UNC system budget even more. Happy New Year, everyone. Remember: for a prosperous year ahead, be sure to eat your black-eyed peas and greens next Wednesday.